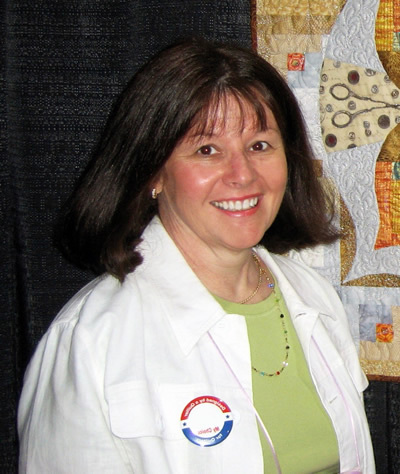 Mary Beth provides lectures and workshops as well as private lessons for longarm quilters and users of Art and Stitch software. You've sewn the quilt top, now what? Learn how to develop a quilting design stash and how to choose and audition designs on your top. Explore principles of choosing designs that will enhance your quilts. Whether you are contemplating purchasing a longarm system or want to learn the basics about the one you own, this class is for you. Detailed information about the operation and care of longarm machines including loading, batting, tension and other basic issues will be discussed. There are lots of ways to quilt feathers. We will discuss the different methods and practice drawing to see which fits your style. Learn the basics and then move on to more elaborate feather quilting. Learn how to safely use acrylic templates with a ruler base. Rulers or templates make it possible to achieve precise accurate quilting designs. Add to your design library using rulers (templates) to create simple and effective patterns you will turn to again and again. Find your way around the Art and Stitch screen. Learn the tools available and how to use them. Borders are the frame for the quilt. Learn the different styles of border quilting and how to create border and corner designs that flow around the entire quilt with no visible start or stop. Basic knowledge of Art and Stitch software required. Imagine a child's delight at seeing her name stitched into her quilt? Or the initials of the newlywed couple? Learn how to use the powerful True Type Font feature of Art and Stitch software. A basic knowledge of Art and Stitch software is required. Learn about the “magic” buttons available in Art and Stitch software. Have fun and amaze yourself by easily creating interesting and complex designs!